BYRD, Troy DeShawn broke our hearts when he passed away unexpectedly one day before his 12th birthday on January 26, 2019. He was born on January 27, 2007 in Springfield to Troy Byrd and Aukeisha “Peachie” Rogan. In addition to his parents, Troy is survived by his siblings: Savion Harris, Essence Harris and Grayson Piper; his maternal grandmother, Rhonda Rogan; maternal grandfather, Timothy Clark; paternal grandmother, Angelique Byrd and paternal great-grandparents, Reverend Herschel and Dimitira Byrd. Troy also leaves behind his uncles, Tylynn Montrose and Malachi Byrd; special friends, Isaiah, Reese and Bryce; coaches: Matt Vactor, TC Underwood and Greg Hower as well as numerous aunts, uncles, cousins and friends. Troy is preceded in death by his maternal great-grandparents, Hershel and May Rogan; paternal grandfather, Sean Coleman; cousin, Braelynn Cutlip; great-uncle, Lewis Rogan; and great aunt Marilyn Wright. 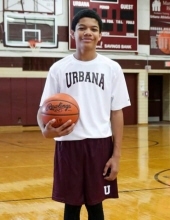 Troy was on the Urbana Junior High Basketball and Baseball teams and also played for their traveling AAU team. He enjoyed playing Fortnite video games and spending time with his family and friends. To send flowers or a remembrance gift to the family of Troy DeShawn Byrd, please visit our Tribute Store. "Email Address" would like to share the life celebration of Troy DeShawn Byrd. Click on the "link" to go to share a favorite memory or leave a condolence message for the family.